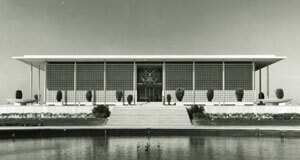 Columbia University Libraries/Information Services’ Avery Architectural & Fine Arts Library is pleased to announce the acquisition of The Jane C. Loeffler Collection of Research Papers on American Embassies, a collection of documents, photos, architectural drawings, interviews and research papers, donated to the library by architectural historian Jane C. Loeffler of Washington, D.C. “It is gratifying to save valuable history from oblivion and even better to find it a proper home where others can build upon it,” said Loeffler. American diplomatic presence are of such critical importance,” said Carole Ann Fabian, Director, Avery Library. Deputy Director, U.S. Department of State, Bureau of Overseas Buildings Operations. This entry was posted in Drawings & Archives, Uncategorized on September 3, 2014 by Ted.